How to make a chicken last a week. 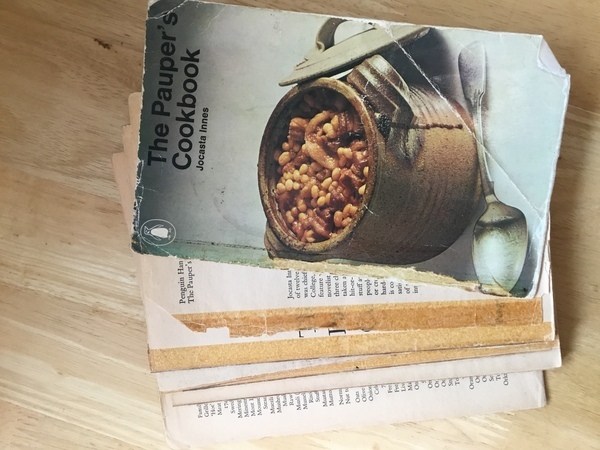 Ok, it’s on the back of another thread, but Mawbroon reminded me of the Paupers Cookbook from my early days of marriage. Saturday: thoroughly sick of chicken, splash out on mince! There. Not a smoothie in sight. I've made a chicken last 3 or 4 days. We like chicken risotto. Fry an onion, add rice, slowly add stock, finish by adding shredded chicken. I always buy organic free range grass fed meat direct from a farmer so it isn’t cheap. I make sure everything is used to it’s best advantage, and nothing wasted. I'm sorry, but as soon as I saw the title of the thread, I just wanted to say "feed it well and keep it safe"! I am not sure if I would eat chicken after day 4 in the fridge. for Wednesday's curry. I used to use this book a lot in the seventies! I often did the Family Meat Loaf and transformed it into Baked Spaghetti later in the week. I called over to my daughter's house yesterday afternoon and as I was leaving she handed me their chicken carcass and asked could I do anything with it. Well I say carcass but it had a full breast left on it and both thighs. I made a delicious, thick Mulligatawny Soup which I had for my supper and enough for a few more lunches, the skin I gave to my dog. Food wise, I waste very little. We had a fairly big FR roast chicken last night - just me and dh. Will have some of the rest cold, chopped and mixed with mayonnaise (not too much) with curry powder, lemon juice and a bit of mango chutney added - plus jacket pots and salad. Then a chicken, leek and mushroom pie, with mash on top. Or maybe a curry. Carcass will be boiled up for stock, final bits will go into a main-course soup - Mulligatawny or with whatever veg I have - or into a stir-fry - doused with soy sauce first. None of it's ever wasted. Though it was even better when we had a dog - after boiling up the carcass I'd strip off every last manky-bit scrap and literally chuck just the bare bones. Our dog would be very happy! Buffy my DD is another who hands over her meaty chicken carcasses to me. I make soup and stock with them. Strong home made chicken and veg broth would be my choice of a last meal on this earth😋! We have half a chicken left over from yesterday. I will curry it today. I confess, I do not really like chicken and only eat organic, I buy the boned chicken thighs from Waitrose. However at Christmas I do have a very large top of the range turkey and oh the joys of a freezer. After 2 days I dismember it, pack it up in small packages of white or dark meat that go in the freezer. The carcase gets turned into sock - and frozen. Each day on until the New Year and everyone goes home, one or two packs come out to make turkey-based main courses and sandwiches and salads in the evening. Over the next few months further packages get consumed and soup made. We finally finished the turkey in mid-March this year - and loved every morsel. I do curries, risottos, fricassees, stews and casseroles, meatballs, soups. Oh th3 Pauper’s cookbook .. it saw me through the early days of our marriage, and still use it now, made the kedgeree just the other day. Many years ago a friend and I were camping. We bought a frozen chicken and used it as a cold block to keep our milk fresh. As it thawed we cut bits off and cooked them on the camping stove. It lasted most of the week. Risky, but we both survived. When it comes to Christmas turkeys, Mum also makes sure the leftovers aren't wasted. She does turkey sandwiches, makes soup out of the carcass and bones, and sometimes will mix some of the meat with the remaining gravy to make stroganoff. When I was a child chicken was only bought for special occasions like Christmas. These days, with only two of us, I get three excellent dinners and a couple of main course soups out of a single chicken. Vegetables are a major part of our diet and we are both great cooks. We often wonder why the younger generation choose to spend so much of their income on takeaways when, for a fraction of the cost, they could eat really well. I have to admit I'd never make a chicken last a week. What I do, on the extremely rare occasions I buy a whole chook, is roast it, enjoy a bit of it then make dishes (curry, soup, risotto etc) the same day and freeze them. The carcass makes a stock for Dal soup the day after I've roasted the chicken. A chicken lasts one, possibly two days in this house. A leg each for DH and DS and breast for me. Second breast sliced for lunchtime sandwiches next day. A long while ago, I did ask the butcher if the chicken would last a couple of days, and he said " if you don;t eat it" which was a bit flimsy, but we did know each other. One flat mate used to borrow my huge brown casserole and make a vast stew....Never with either onions or garlic , so tasteless generally. Then she would invite friends over the week, heating the casserole as she went. She would invite us on the last day , sadly we had to decline in the interests of stomach welfare. Roast Chicken: once hot with hot veg, once cold with salad, one made dish (curry? pie? whatever) and soup from carcass). If there's enough meat, I sometimes freeze slices ready for sandwiches. It works for us.